Babs Young has been watching movies for a week. 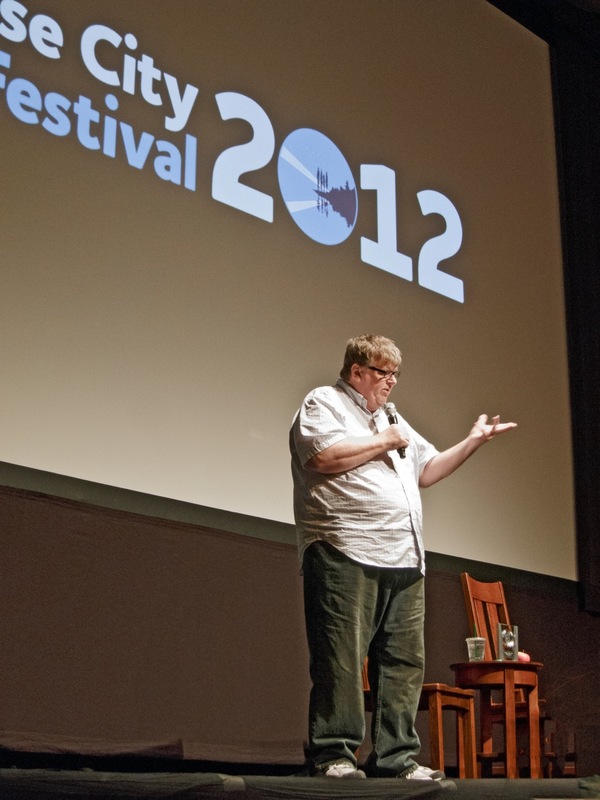 On Sunday she wrote: The 8th Traverse City Film Festival concluded today. I attended a marathon of 12 films. The closing film was The Zen of Bennett, made by Tony’s son Danny, who was here along with Unjoo Moon and Jennifer Lebeau. It was fabulous. This is, of course, Michael Moore during his annual Mike’s Surprise performance. Those who follow Michael on Twitter were able to go with him on one of his famous walks. In fact, those who were at Lars Hockstad Auditorium were able to follow Michael out the door and go on the real-life walk. Miss Sadie and the Cowboy are overjoyed. They feel that I spend altogether too much time gazing at the monitor, and wish to follow Michael Moore’s example. A good walk may not solve every problem in the world, but it’s a start. One paw at a time. Babs concluded: Thanks Michael for a great festival. I do wish you luck. Recruit Spud for the campaign. He will gaze soulfully at Teenage Boy and the next thing you know they’ll both follow you down the lane. Convincing is much harder to do than hiding the modem, I find. I got my teenage boy out of the door in a flash. Dog happy, mother relieved. Joss you are a rascal. A walk is always a good thing, whether in the city or the country. On line gaming is fun too. I have never tried on line gaming, but I am addicted to solving historical puzzles, and can follow online rabbit trails all day unless forcefully reminded that the present needs attention. I gotta start paying the ransom to keep ads off this site. WordPress has got it cleverly set up so that we, the bloggers, can’t see them unless we go to a lot of trouble to disguise ourselves, so I never know what they’re pushing. Michael would agree with you about the walking. He’s on a mission to get fit. I hope it works. He’s got a lot of great movies yet to make. I’m pretty sure the solution to many kinds of misery is to find a desirable alternative and Just Say Yes to that. Out we go. Maybe we should challenge ourselves to a walk a day. Couldn’t hurt. And certain furry members of our families would be grateful. Walks Around Here are not optional. Sometimes very brief, but never optional. I’m pretty sure the solution to many kinds of misery is to find a desirable alternative and Just Say Yes to that. There it is. The single best statement of 2012, if not the decade. Heck, I might even go for the century. I am feeling very enthused about that statement. I may have to end up quoting you on that. I cannot tell you how it brightens my morning to have you say that. Thank you. Walking every day is no problem either here; my small but determined four-legged friend knows how to convince me just in case I would not be. I call this : “Déménagements en tous genres” = “Removals of all kinds”. Cushions, shoes, small carpets, etc. I seem to get less and less screen time. I do not miss it at all. Michael Moore is very popular over here and rightly so. Déménagements en tous genres describes Miss Puss’s approach to getting me out of bed in the morning. She’s very good at it. Michael Moore is very popular in our household, even with the Cowboy, who is a fiscal conservative.